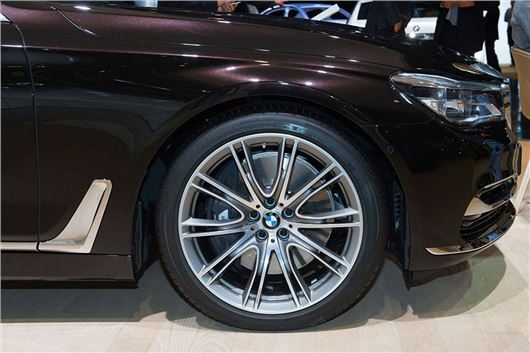 On the heels of launching its new Driveguard range of 'punctureproof' tyres, Bridgestone has won important new original equipment contracts for runflat tyres with BMW. The top-of-the-range luxurious BMW 7 Series saloon, launched las year, is equipped with Bridgestone Potenza S001 UHP sport tyres in six sizes, all with the added safety of RFT (Run Flat Technology). Potenza S001 is Bridgestone’s flagship UHP tyre engineered for high-speed performance, delivering impeccable precision response and wet control for powerful cars. The selected winter fitment includes the Blizzak LM001 RFT in two sizes, which received the highest test rating from ADAC, German Automobile Club. Bridgestone is also supplying its flagship premium touring tyre, Turanza T001, for the latest BMW X1 model, with three sizes in run-flat and three standard. Turanza T001 is engineered to give the smoothest ride with stability at speed and confident wet handling. The winter fitment is Blizzak LM001 RFT in two sizes, with LM001 standard on the smaller 60 series size. These new original equipment contracts build on long-standing collaboration between Bridgestone and BMW both on and off the race track. Over the past 20 years this partnership has grown to include a long list of factory fitments, exclusive collaboration with the BMW Driving Experience programme and joint technological developments including Run-Flat Technology (RFT) tyres. More recently Bridgestone was selected as exclusive tyre developer for BMW i vehicles, supplying Ecopia EP500 tyres with ologic CO2-optimised technology for the urban all-electric BMW i3, and Potenza S001 UHP sport tyres for the BMW i8 electric hybrid model.